From the challenging, short climbs of the Owens River Gorge to the big walls of Yosemite and towering Sierra peaks, sport climbers rave about the exhilarating options in the Mammoth area. It's also a local passion, so you'll have no problem finding equipment or experienced guides and instructors to get started - or get more adventurous. 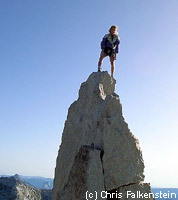 The Sierra has been well known to rock climbers and adventure seekers for years. With Yosemite's famous Half Dome and El Capitan close by, it was only a matter of time before climbers ventured further east to areas near Mammoth Lakes, June Lake and the nearby Owens River Gorge. Learn to rock climb on Mammoth's man-made Climbing Rock or venture to such natural wonders as Deadman's Summit, Indiana Summit, the Geothermal Boulders, Rock Creek, Alabama Hills and the Buttermilk. For the beginners, Mammoth Mountain delivers adventure and recreational programs in style with a 32-ft. high climbing rock, challenge ropes course and junior ropes course and orienteering course. Learn to navigate, build confidence and gain new skills with experienced leaders and instructors. You can't miss the rock when you drive up to the Main Lodge. If you are visiting Mammoth in the winter months, give ice climbing a try for an exhilarating experience. Lee Vining Canyon is the number one destination for ice climbers, followed by June Lake. Guides and Guidebooks are available at local stores describing the area's many great climbing areas.